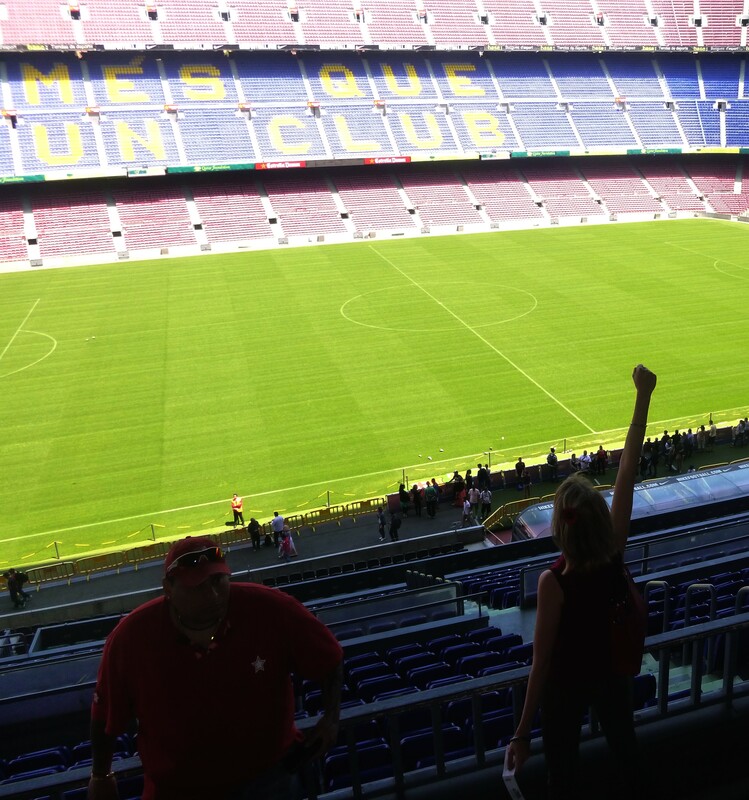 Whether you’re a football and/or basketball fan or not, doing the “Camp Nou Experience” is something you should do in Barcelona. Yes it seems quite expensive at first, especially when you think “im just going to see the stadium… great.” But in fact, it is very much worth it! I paid as much as I did for the Sagrada Familia and enjoyed it 500x times more (and I’m not a big football fan). 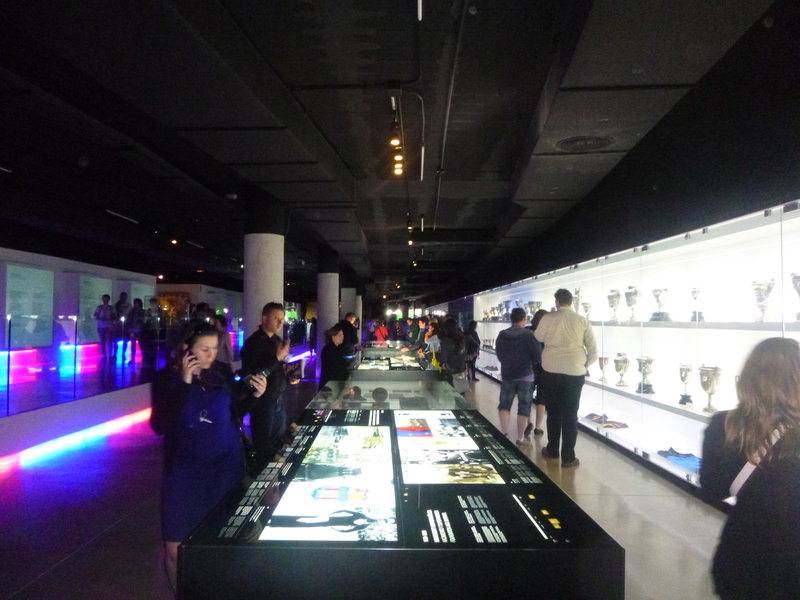 The thing is when you pay for the Camp Nou Experience tour, you discover the impressive and big Camp Nou Museum. There you discover how the FC Barça came to be, how the events of each generation affected the club, how important it was during difficult times and the various “star players”. In addition, all the cups and jerseys are on display! 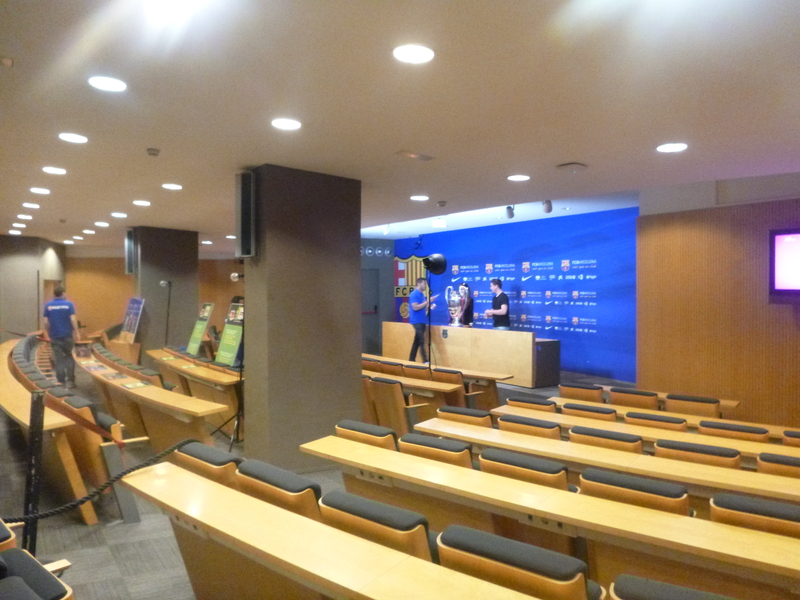 Visiting the locker rooms, press room, radio/tv room and vip lounge are also on the list. You can also observe the field from a normal spectator’s point of view and from the VIP seats! 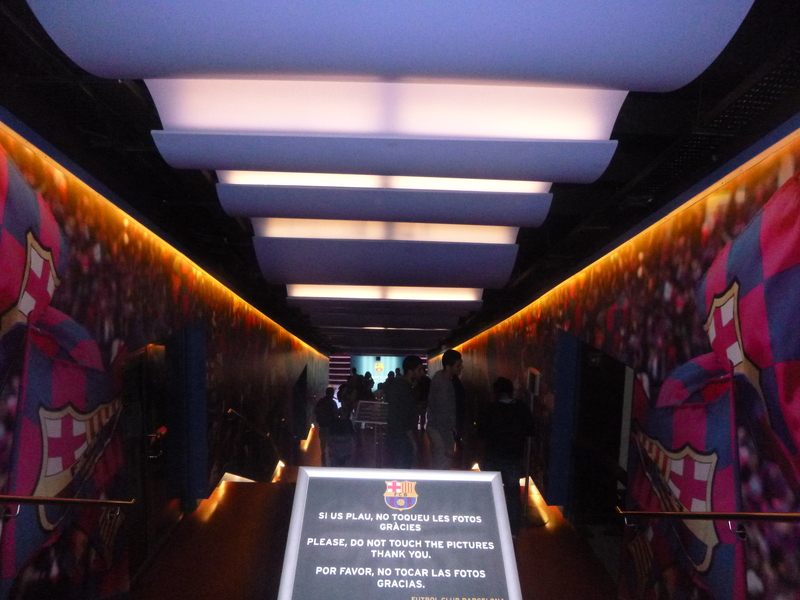 Throughout the tour, take pictures with the football players and the cup! (thank you photoshop!) Like them? buy them at the exit! This experience lasted for about 1h30. And what better way to finish than by sipping on a nice Estrella Damn in the sun in the bar reserved for visitors? Cataluña is very different to the rest of Spain and Europe; they have their own language, different traditions and their own bank holidays. Every day I’m discovering more about this rebellious region which doesn’t feel “part of Spain” and wants its independence. As much as this blog is dedicated to restaurants, bars and cafés in Barcelona I would like to talk about a certain event that I thought was very interesting and fun: Sant Jordi. Let’s go back to February 13th. On our lunch break, Laura was talking about a book she needed to buy for her boyfriend and what she was going to wear and do for Sant Jordi. (Light-bulb moment: something about Sant Jordi being Catalonia’s Valentine’s Day). 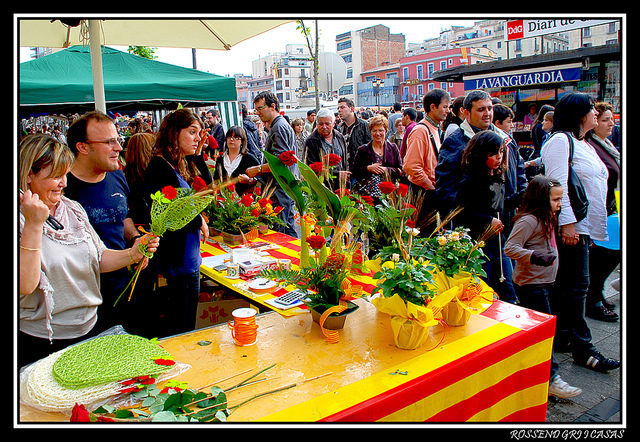 Sant Jordi is celebrated on April 23rd. Legend says there once was a dragon that killed everyone in a little town. In order to satisfy the dragon’s hunger, the people would sacrifice sheep and cows. But when they no longer had any they decided to use humans. One day the King’s daughter was chosen. He begged the people to spare the princess’s life and said he’d give them all his gold and kingdom. The people rejected his offer and allowed him 8 days to say goodbye to his daughter. On the 8th day, the princess was brought to the dragon’s cave. As the dragon was about to devour the girl a knight on a white horse arrived and threw his sword straight to the beast’s heart. From the animal’s blood blossomed several roses. Jordi, the knight, took the most beautiful one and offered it to the princess. The King, full of joy and gratitude asked him to wed his daughter. He refused and left the kingdom. The tradition, hence, is that every man offers a rose to his girlfriend/wife, mother or/and close girl friend on the day of Sant Jordi: April 23rd. Sounds like Valentine’s day right? Think again! On Valentine’s day, the women are the spoiled ones: men give us a rose and we don’t do anything in return (traditionally). However, over here, the men also receive a little gift from the girls: a book. Indeed, April 23rd is also the day of Shakespeare’s and, famous Spanish author, Miguel de Cervantes’s death. To honor them women offer books to their boyfriend/husband, father and/or close guy friends. In addition, the reason why everyone knows it’s Valentine’s day is mainly due to the publicity in the streets and the shops decorated with hearts everywhere. 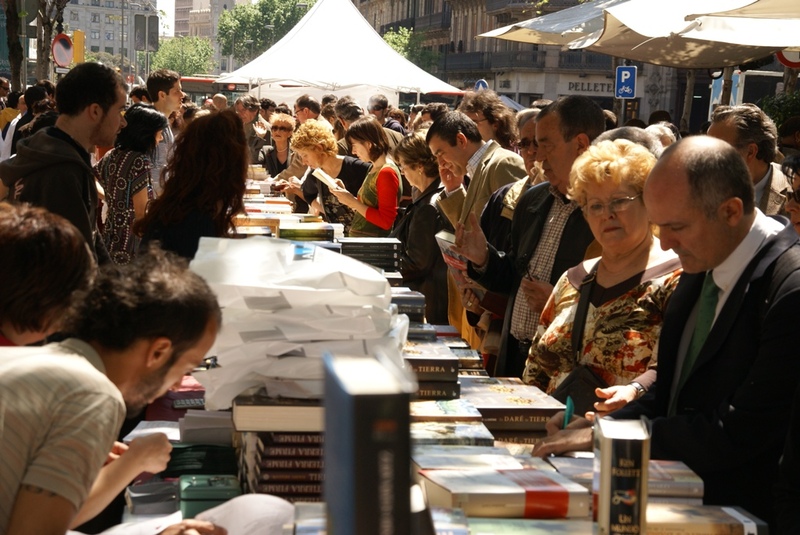 However, over here, as much as you see the “Sant Jordi Menu” signs outside of almost every restaurant and café, that is nothing compared to what you experience in the streets. During the day you will see practically EVERY girl with one or several roses! It’s insane! In fact, 40% of Catalonia’s Rose sale happens on this very day and 10% for the books! I walked out of the Sephora located on the top of Rambla Catalunya when I noticed there were people setting up little stands. Hmm.. already setting up the stands for the next day? Ok this must be quite a big thing. Laura had told me people sell roses and books on the streets. Again that is a difference compared to Valentine’s day: you do not buy the gift for your partner on your own in advance: you walk down the streets together and look for the prettiest rose for her and the perfect book for him. So if you’re ever in Barcelona around April 23rd, don’t forget to buy your loved ones roses or books! La Rambla Catalunya (not to be confused with las Ramblas!!) is the main street where everyone goes! Shaz Guestlist – ADIOS paying for Clubs: Hola FREE ENTRANCES! In addition to providing free entrances and offers, you also receive daily updates of what’s on and the best places to go to. And if you’re lucky, you may be in Barcelona in time to enjoy one of Shaz’s famous Valencia, Alicante or Sevilla Trips! So what have we learnt today? For unique (and cheap!) pre-drinks check out the Bars category of this blog!